The morning before she died, it was clear that she felt the brush of death. That’s why she was so restless, struggling against the rope that was tying her hooves to the wooden pole. Tears blurring my eyes, I watch from the steps of the Big House in our yard. Maybe I was stupid to have gotten attached so quickly to a being that was bound to die for my sake. I had never had to face this back in America, where our McDonald chicken nuggets came in bright bags and toys to mask the pain that the animal felt. But here, the policy seems to be that if you are going to eat an animal, you have to be willing to look it in the eye. Slowly, time crawls by. The sun rises, so achingly beautiful in the Ethiopian sky, and people file out the gate to attend morning prayer. The church bells clang in the distance and even from the distance, I hear the priest’s liturgy carrying over the trees. Finally, several hours later, as the sun starts sinking into the night sky, I tentatively step out of the house. She’s dead. It was quick. They prayed over her, then slit her throat so she wouldn’t feel any pain. As evening blankets the world, I’m laughing and playing hide and seek with the other kids; I’d already forgotten the cow, the cow who had made my heart hurt, the cow who made me cry, the cow who remembering later on made me consider being a vegetarian (emphasis on consider). But in that moment in time, I had already forgiven and forgotten. I was ready to eat. There’s eating in America, and then there’s eating in Ethiopia (and yes, there is food in Ethiopia, despite being the laughingstock of all the famine jokes.) In America, we eat because there is the three-meals-a-day rule; we eat because there is food and so much of it; we eat as we’re watching Netflix; and we eat when we simply have nothing else to do. 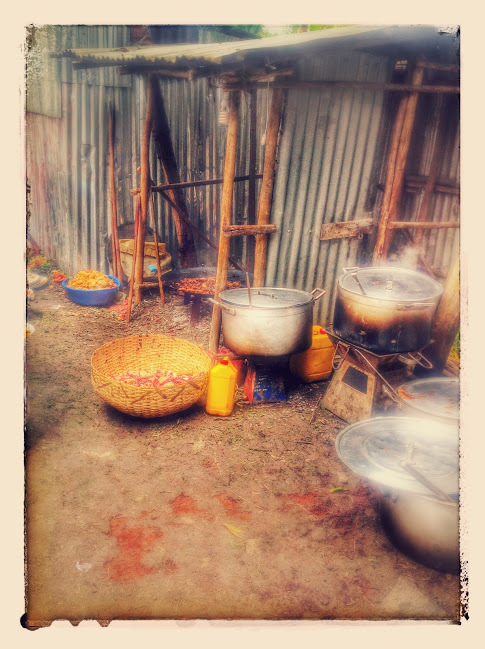 In Ethiopia, each bite has meaning, each gursha shaped with love and force fed to you by your grandmothers. This summer is my first time in Ethiopia after almost six years of living in America. It all comes back to me as I watch the scenery again. 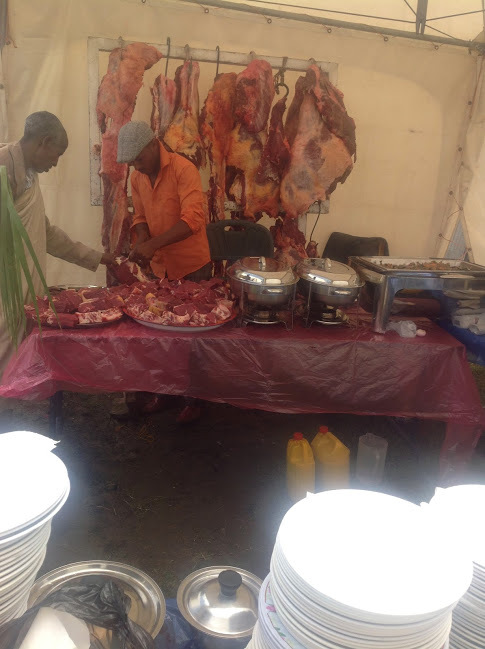 My uncles buying a cow from a market, then the long preparation. 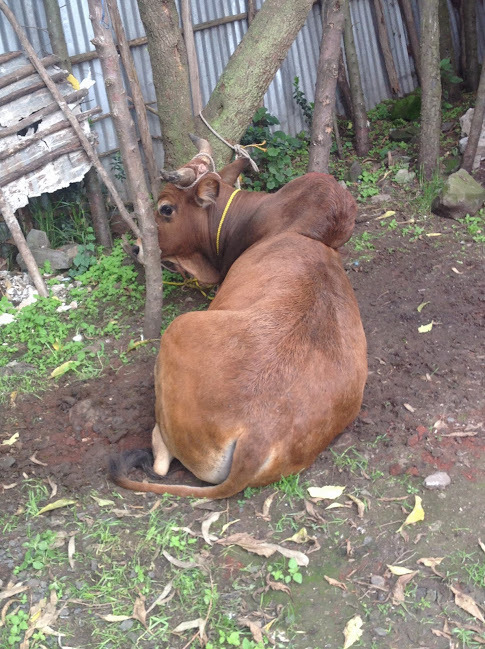 The cow is butchered in the front yard and everyone is given a role: skinning the hide, cutting the legs, cleaning the insides, throwing out the waste. Once the meat is ready, the women set up kitchen outside, making little bonfires and heating up gigantic pots to make kitfo and doro wat. The smell of spices and mouth watering delicacies waft through the cracks in the walls and into every house in the neighborhood, enticing them. Like bees drawn to honey, the prospect of such a feast lures the adults, the kids, the homeless—anyone and everyone. In the end, the best part isn’t eating the food; it’s everything leading up to it. Bonfires that last all night long. Nights spent huddling on the grassy field with all the neighborhood kids, watching the stars twinkling and telling ghost stories. The warmth of the air envelopes us all long into the night. Times spent sneaking behind the adults and pilfering pieces of meat to cook like marshmallows in our own little bonfires. America has everything. Everything except this. As I board the plane a week later, I swallow a sob, wanting so badly to have both worlds at once.